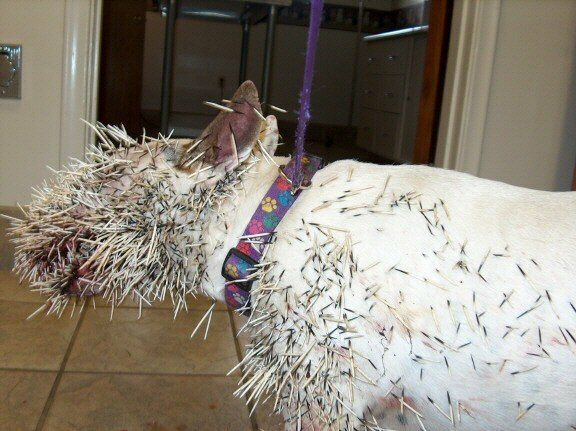 I bet the Porcupine is telling his friends, "you should see the other guy"
Walrus, no it isn't my dog thank goodness, a friend of my wifes e-mailed these pictures to her. Is it a pit bull?? I wouldn't want to give it a bath. It looks more like a "Bull Terrier". 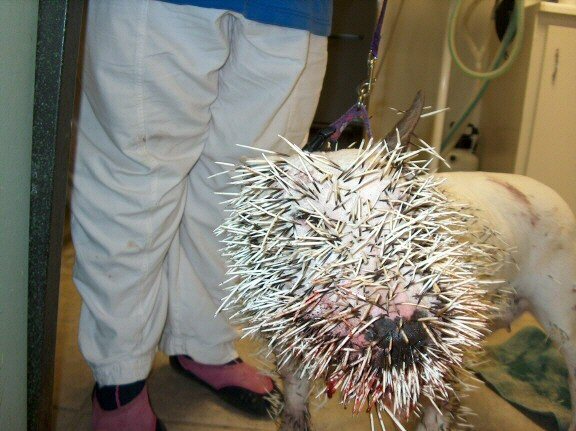 Actually the dog probably didn't want to fight, but the Porcupine was making fun of his collar. It's a Staffordshire Bull Terrier, not to be confused with a Pit Bull. Very good loyal family dog, but is fearless when roused! A typical Limey? I can't be the only person that thought of "Pinhead" from the movie Hellraiser when I saw this picture!